This one was all Cincinnati, as the Bengals dominated from the opening whistle. 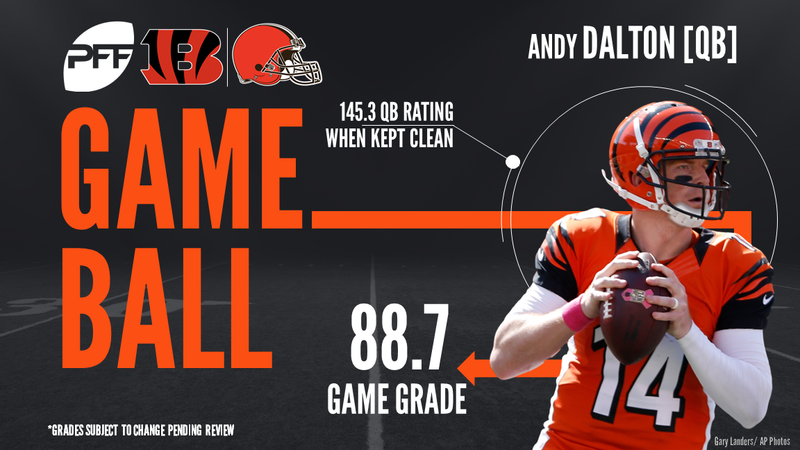 QB Andy Dalton threw three first half touchdowns, one each to to WR A.J. Green, TE Tyler Kroft and HB Giovani Bernard. Cincinnati entered halftime with a 21-0 lead over their cross-state rival. The second half was more of the same as the Bengals would get another Kroft touchdown and a field goal before a late touchdown from the Browns kept them from being shutout. Cincinnati cruised to an easy 31-7 victory and with that, we give you our PFF exclusive takeaways from the contest for each team. This is the Andy Dalton the Bengals needed to start the season. Dalton was quick (1.95 second average time before attempt) and precise, missing his target only three times all day long. It’s not a stretch to think Cincinnati would be 4-0 if this guy showed up every week. Kroft did a spot on Tyler Eifert impersonation all day Sunday. He caught all six of his targets for 68 yards and two touchdowns. Dennard quietly had his second nice game in a row. He was targeted five times in coverage and only allowed two catches for nine yards. Dennard’s six coverage stops over the past two weeks are the most of any corner in the league. After a breakout game against Green Bay, Jackson came back down to Earth a bit versus Cleveland. He made multiple nice plays with two pass breakups to his name, but also gave up a big 26-yard first down conversion and commited two interference penalties. The numbers look worse than the grade once again because of five drops from his receivers (one of which resulted in a pick). But at the same time the grade isn’t quite indicative of Kizer’s struggles to move the offense because of how often he refused teo pull the trigger. 26 of Kizer’s 39 dropbacks took 2.6 seconds or more and on those passes he was only 8-of-23. Coleman handled himself well against Carlos Dunlap in pass protection, yielding only three hurries on 51 pass blocking snaps. It was the highest graded game of Coleman’s young career. Sunday was a career-day for Ogbah overall. He had a sack and a hurry as a pass rusher, and three stops in run defense. He also forced two fumbles for an all-around superb day. It seems like the only player in the Browns secondary who didn’t get exposed at one point or another on Sunday was Taylor. In 34 coverage snaps, he was targeted once and he broke that pass up.